Viking Parker May (3) drives through the Ambrose defense in Challis’s second game of the state basketball tournament. Challis Viking William Ashley (4) got open for a short jumper in the key in the Feb. 28 state tournament game against Prairie. Challis players Garrett Millick (2) and Mitchell Cotant (1) knock the ball away from the Ambrose post in state tournament action on March 1. Ross Sheppeard (10) rushes in to help. Garrett Millick (2) leaps to shoot over Prairie defenders as Challis teammate Riley Shaw (15) moves to the bucket. Challis lost its opening game in the state tournament to Prairie. The Challis Vikings’ team bus had to take the long way to Caldwell for last week’s state basketball championships because of road closures and avalanche danger. 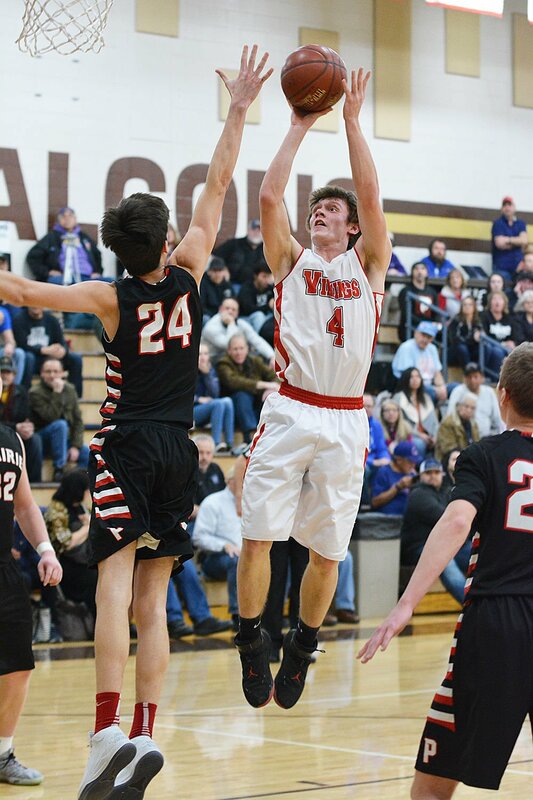 The Vikings faced the Prairie Pirates in the first round of the tournament in a Feb. 28 game at Vallivue High School. It was the Vikings’ first appearance at the state tournament since 2015. Challis lost the contest, and Prairie went on to take the state 1A DI title. The game against Challis was their closest game of the tournament. The Vikings played well in the first quarter against Prairie and were down by two points when the buzzer sounded. The Vikings outscored the Pirates in the second quarter and at halftime were down by just one point — 20-19. Challis had a good run in the third quarter and got an 8-point lead, but ended up losing the lead as Prairie scored 10 unanswered points. The Vikings were down by one headed into the final quarter. Challis missed a couple of layups in the fourth and Prairie had their best quarter of the game, scoring 14. That put the Vikings on the lower side of the score, 45-38. Top scorers for Challis were Parker May with 16, William Ashley with 7 and Isaac Schwenke with 5. 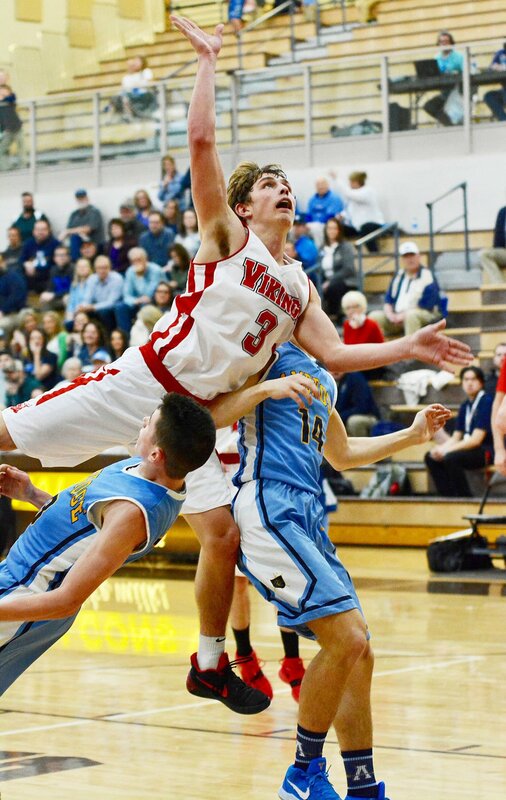 The loss on Thursday sent the Vikings to the consolation bracket. The Vikings played the Ambrose Archers on Friday, March 1. The winner — Ambrose — moved to the consolation championship. Ambrose ended up the consolation winner. Challis was down by one at the end of the first quarter, but ended up having a terrible second quarter, scoring just 4 points to 21 for the Archers. It was a lot of points to make up and the Vikings were unable to do it, in spite of scoring steadily along with the Archers the rest of the game. Challis lost 59-38. Leading the Challis scoring effort were Ashley with 17, Carson Ammar with 8 and May with 4. The loss meant the Vikings exited the tournament and wrapped up the season with a 16-8 record.